Singer/songwriter AJ Edwards has released his new EP, “Where the Rain Ricochets,” to fan and critical acclaim. Music by AJ Edwards is passionate without being over-emotional, talented without being pretentious, and extremely easy on the ears. He writes chord progressions like an old pro, drawing from tried-and-true combinations that have been in circulation since the guitar was just a lute, while at the same time retaining a few tricks of his own that seem to come from nowhere just when you least expect them, throwing the odd minor chord among his usual majors for that perfect, edgy tone, and switching up his strum pattern when the traditionalists aren’t looking. 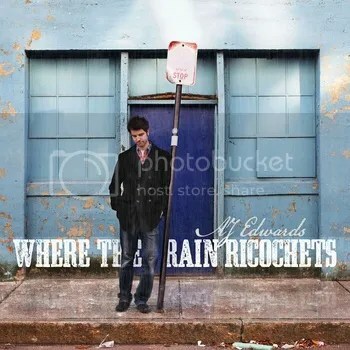 That’s not to say Edwards isn’t a traditionalist – “Where the Rain Ricochets” is gorgeously traditional musicianship from a modern, American, male singer/songwriter, making Edwards part of a musical genre that adds fewer and fewer members to its ranks every decade. Edwards’ personal taste has much to do with his lyrical themes and overall tone, as well. He names U2, the Beatles, Bruce Springsteen, Jeff Buckley, and Tom Petty among others as major influences.He particularly appreciates the music of Richard Marx. “I really just try to convey my love for great songwriting and personal themes,” says Edwards of his writing. “Someone like Richard Marx, who just writes these absolutely timeless songs that everyone can relate to – that’s the kind of artist I hope to someday be.” With tracks like these from “Where the Rain Ricochets,” as well as much professional backing from experts like Aaron Johnson (multi-platinum producer behind the Fray who engineered three of the tracks on “Where the Rain…”), AJ Edwards is not likely to keep out of the mainstream long.